Precious metals futures split Tuesday. Silver declined, slightly, following two days of gains. 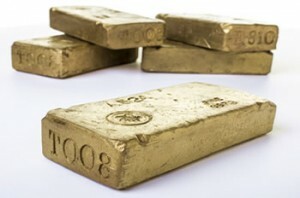 Gold finished higher for a third session in a row and marked an almost two-week high. Gold for June delivery added $6.40, or 0.5%, to settle at $1,308.30 an ounce on the Comex division of the New York Mercantile Exchange. The settlement was the highest since March 27. "A modest slowdown of the greenback in conjunction with some uncertainty in the stock market were enough to push bullion prices up, confirming firm investor appetite for gold," MarketWatch quoted Carlo Alberto De Casa, chief analyst at ActivTrades. Gold futures ranged from a low of $1,300.60 to a high of $1,310.40. They also gained 0.5% on Monday. Silver for May delivery shed a half cent to close at $15.211 an ounce. Silver futures traded between $15.18 and $15.31. They rose 0.9% on Monday. July platinum declined $13.60, or 1.5%, to $899.30 an ounce, ranging from $859.30 to $915.10. Palladium for June delivery gained $9.50, or 0.7%, to $1,362.60 an ounce, trading between $1,340.80 and $1,373.30. Gold rose $3, or 0.2%, to $1,303 an ounce. Silver added 11.5 cents, or 0.8%, to $15.255 an ounce.